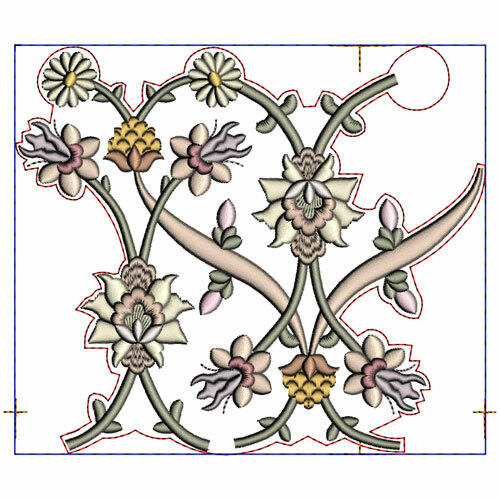 The Katie Grace collection was developed from a lovely clipart panel and named after my first granddaughter. 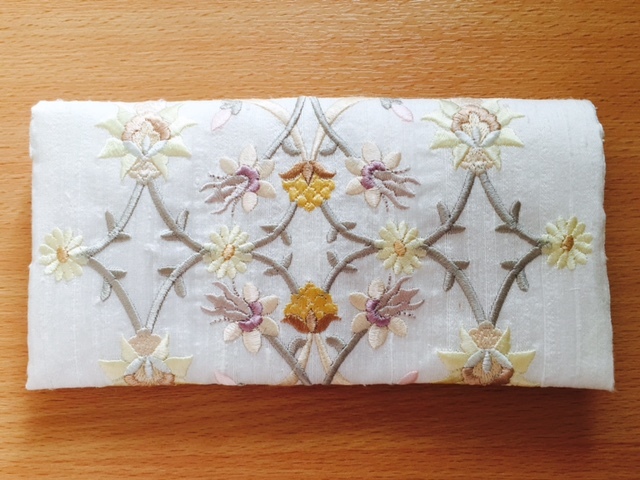 I had always intended to create this panel as an embroidery fabric block and at last I have finished it. 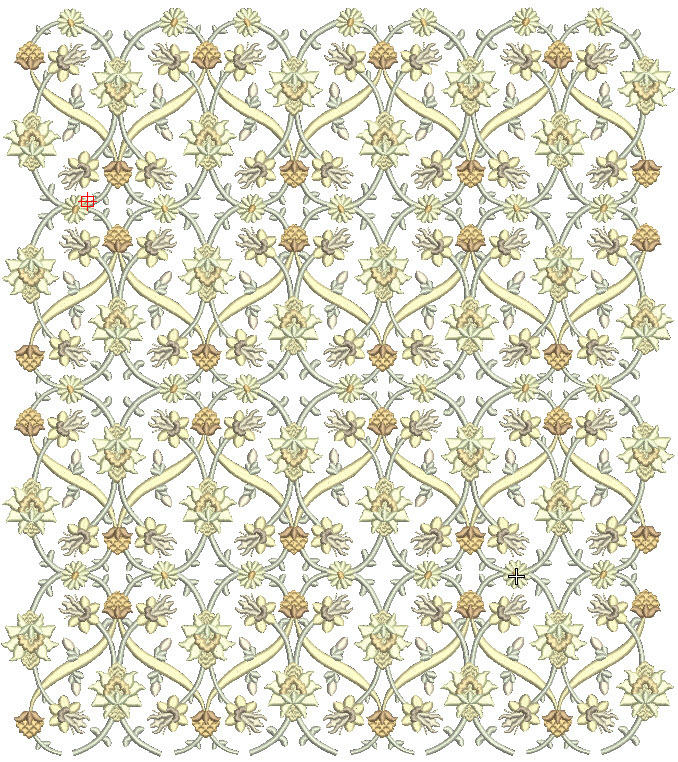 There appear to be so many possibilities for using this embroidery design. in preparing it I have tried to offer several sizes and versions of the panel including a small version for those with limited sized hoops. As always hoop sizes where a challenge for this embroidery as the design itself could not be compromised needing to fit like a jigsaw puzzle piece, above, beside and below itself. 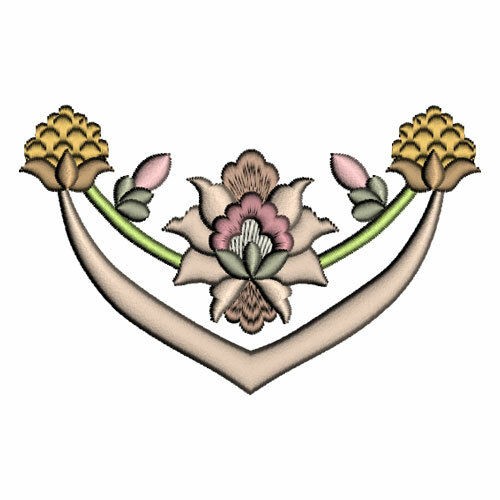 However I managed to create this small design that will fit in 5″ by 7″ hoops so most of you can embroider it out. For the fabric block I have changed some of the colours to tone down the design overall. 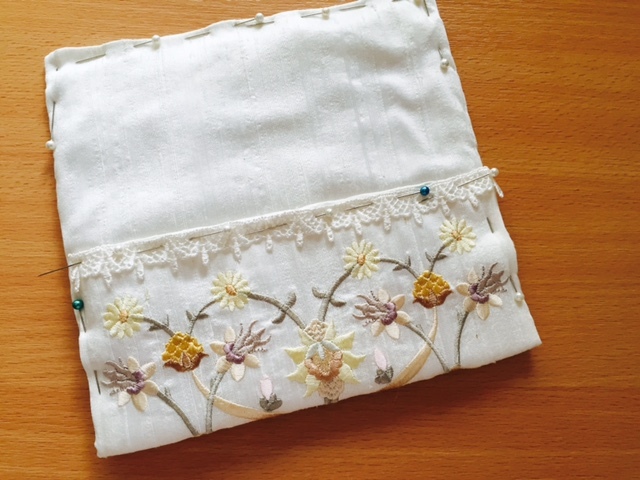 My first test stitch out was on lovely slubby ivory silk dupion and I was delighted with the results. The main panel is a stand alone design for those instances where you only require an area that is just 246.1 mm (9.69 “) by 181.8 mm (7.16 “). 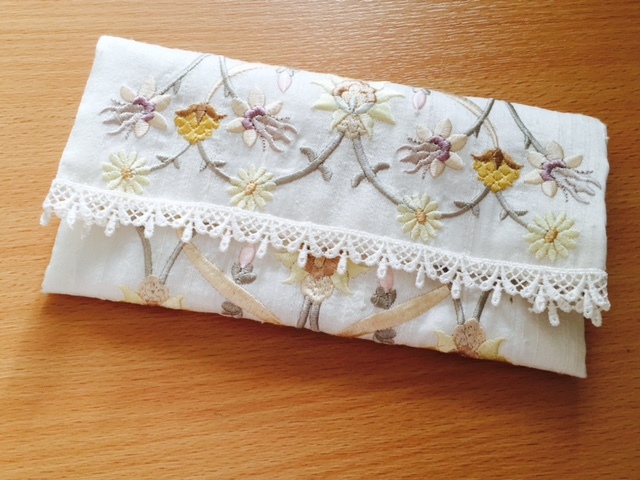 This is perfect for making a small pouch or case to hold sewing items, make up, tissues or money. Anybody would love to receive this as a gift in their favourite colours. Line the fabric piece after removing all the Stitch and Tear stabiliser (that took about 20 minutes) or just cut enough fabric so you can double it back on itself. I inserted some thin batting between the layers to add strength and depth. Tidy the ends attaching lace to finish it off. Fold it over twice and secure the edges. When I pressed the embroidery on the back to set the stitches I loved the way they stood out and as always at this point I wondered about a little crystal embellishment. Last time I looked at Design by Dawn she had some amazingly beautiful crystal pearls which would look perfect hot fixed to my embroidery. 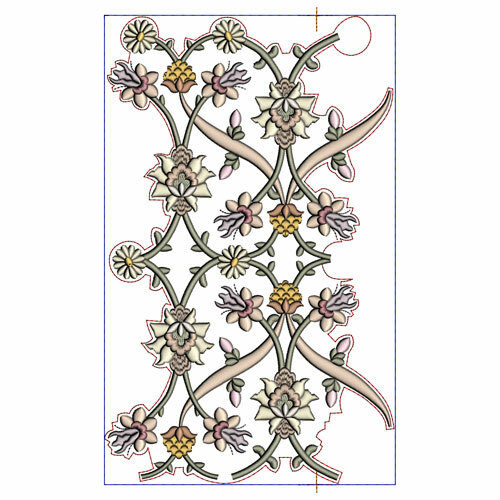 If you need to enlarge the embroidery there are always the small designs from Katie Grace 1 such as GFE-KGR-1-5 which could be embroidered out on the top so that your flap could be curved following the line of this design. Add some sort of fastener underneath or a more elaborate one on top! 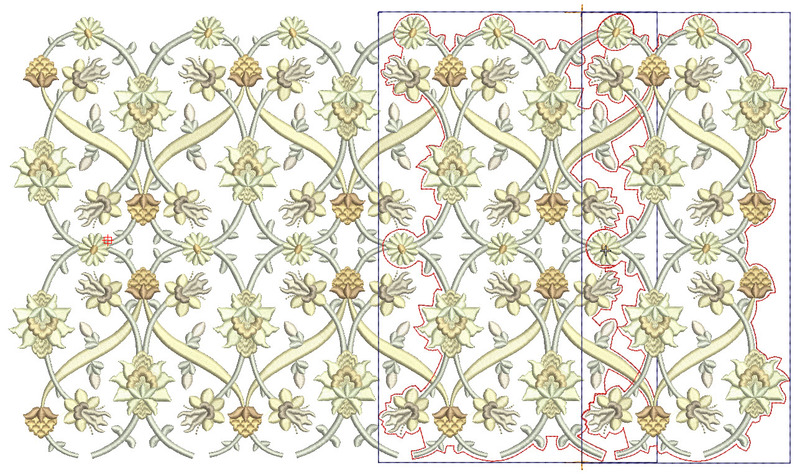 The PDF which comes with the Fabric block shows how the designs all fit together and gives the sizes of each design. Please request this before purchasing if you need to check them over to see if your hoops will accommodate the designs. I see all sorts of uses for this lovely design. Use the Fabric block to create padded cases for your phones, tablets and computers. I can see a remarkable tote bag using the fabric block, a splendid cushion or a cover for your embroidery machine. Along with the designs in the Katie Grace Collection you could create a marvellous jacket too using the Fabric block for pockets, cuffs and maybe a collar. Last night I wondered how the block would stitch out with some thin batting laid underneath. I shall be interested to hear what embroidery projects these designs inspire you to create! 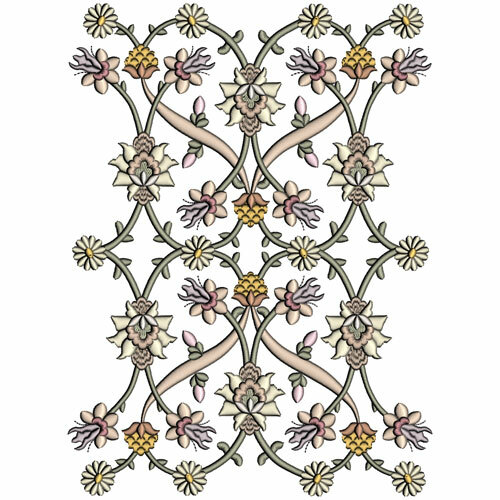 This is the main fabric piece and you can see that the daisies are not shown at the bottom or to the right because they will be stitched out when the design is place below or to the side. 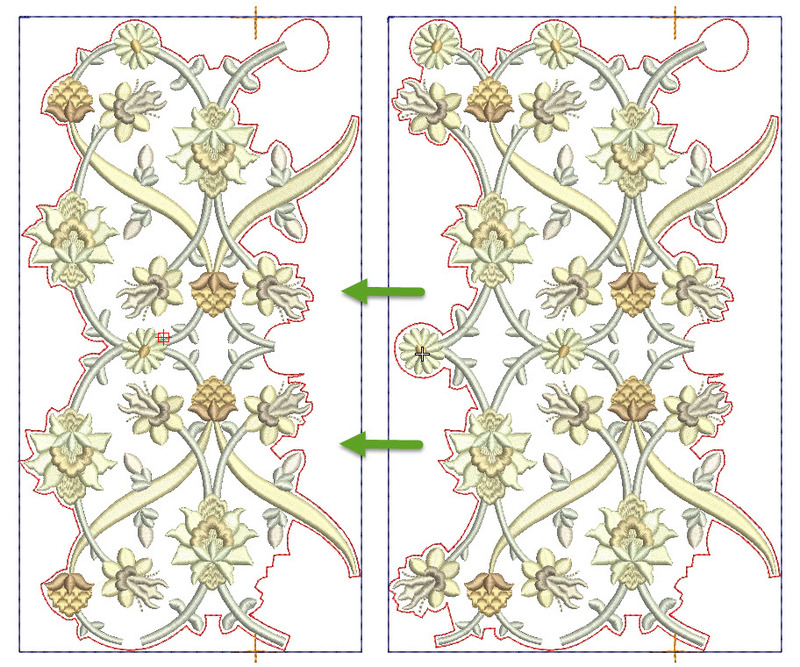 This shows the sequence of designs required with the GFE-KGR-fb-start and GFE-KGR-fb-end to give neat ends. 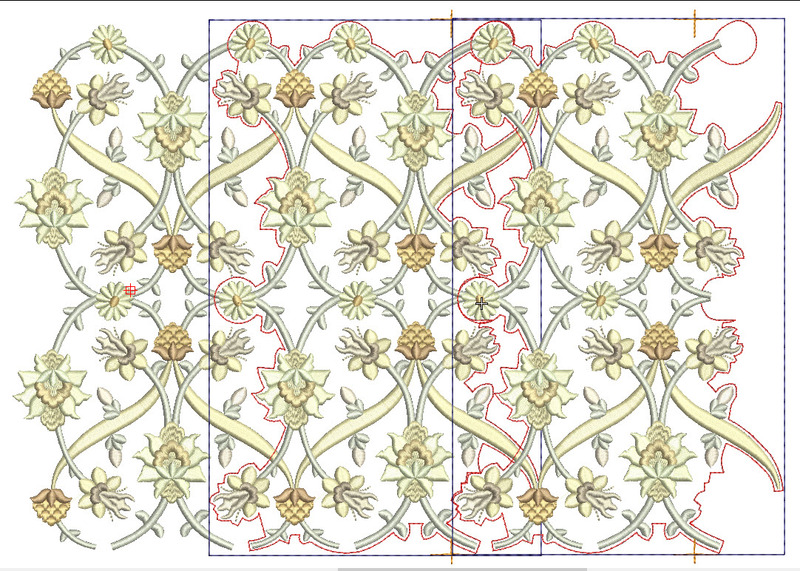 The Katie Grace Fabric Block will be released on 9th May, 2015. 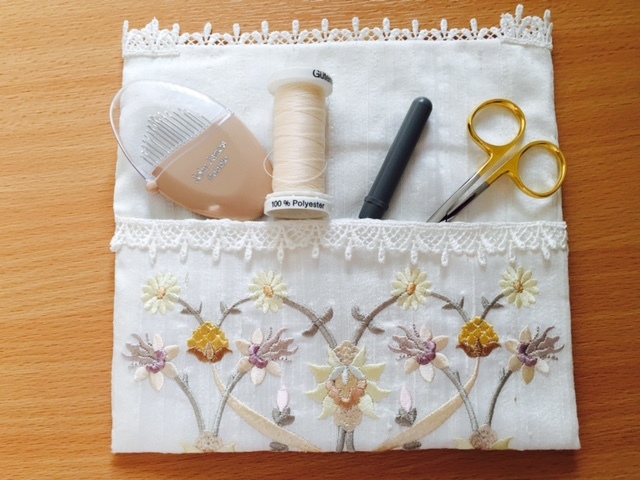 This entry was posted in Discussing machine embroidery, Embroidery projects, New Designs and tagged Making embroidered fabric. Bookmark the permalink.